I personally Love Cardamom tea. Cardamom (elaichi) is the "queen of spices", it is one of the most valued spices in the world. Cardamom has a strong, unique taste, with an intensely aromatic fragrance. It has following important health benefits. Cardamom is used chiefly in medicines to relieve flatulence and for strengthening digestion activities. Ground cardamom seed mixed with ginger (adrak), cloves (laung) and coriander (dhania), is an effective remedy for indigestion. A tea made from cardamom is valuable in headache caused by indigestion. This can also be used as a remedy in the treatment of depression. It can be used to prevent and treat throat troubles, and congestion of the lungs. Daily gargling with an infusion of cardamom and cinnamon (dalchini) cures pharyngitis, sore-throat and also protects one from flu. Thanks for this information. 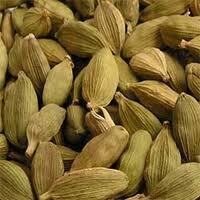 I have known people to chew cardamom to help quit smoking. It also helps that it's a natural anti-depressant for the nicotein fits. Spices have many skin and health benefits as anti-inflammatories like ginger and rosemary that reduce swelling in skin.